Remember the first time he asked for a really good reason to NOT run? Well, apparently my concerns of him breaking a leg, falling or dying wasn't good enough. It did though come to some point that I really did just want him to run, because I could feel that he really wanted to do it. But then our little bean came into the picture. So he's decided to give up his kit and not run this coming weekend. So the "I have to run TNF100 this year" goal is out for now. Maybe next year. The new goal is to do a sub-four in a marathon. There are two coming up this June-July, and there's a 50k trail as well that's under consideration. But as of now, much of our excitement (as well as the grandparents-to-be) is on getting our bean healthy and well. I'll have to get a nice chair for finish line waiting now. Haha. Finishing a race, it's great to get a medal. And it's really great to get a trophy. Sometimes, you also get a finisher's certificate. Having completed the Standard Chartered HK Marathon, the race kit says that they'll actually mail you an official certificate of achievement. Isn't that way cool? They'll actually go through all the effort of mailing stuff, no matter where you came from. Well, I guess it would just be fair, since we flew to HK for it anyway. But still. And hello lookie what we got in the mail one day! It actually looks really cool. The paper is nice too. Like, with full-on colored printing. No scrimping on ink there. Nice, I would say. But wait. What's that? Oh my glorious typographic God. DID THEY JUST USE COMIC SANS? They did! Your name, for all the hardship of running through biting cold weather, breaking through and surviving with tens of thousands of runners - it is written in all capitalized glory of Comic Sans. Ugh, I cannot express my utter hatred for this typeface. I'm sorry Standard Chartered, the prestige just got bumped down by the use of the most loathed font by typegeeks around the world. Okay, I will leave that now and go onto more uppity news. We are pregnant! Just a couple of weeks along. Maybe a month. As my cousin says, what a way to get out of running. Haha. I am now officially regressing my jogging program. Also because I haven't done anything fitness-y for more than a week. Which would probably make this kiddo a BDM baby. Which would kind of dispel the belief that marathon and/or long-distance running would make it umm, harder. Which brings me to the third subject of this post: there's a really cool trail run coming in July. The TNF100 we're not actually sure if we're attending. Well, Chips hasn't decided yet if he's to still run it or not. A lot of sacrifices are going to be made in the next 9 months, and I really hate that it could hold back on the hubby's joy for trail running. 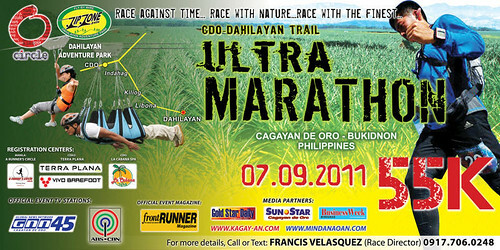 Anyway, the July trail run is in Cagayan De Oro, Mindanao. It's so cool. You get to run through pineapple fields and mountains. More details are in TBR's blog. The race is organized by a good running friend of Chips, which is also a motivation for us to go. My original motivation was to get to try the zipline which is in the park where the finish line is. It's actually the longest in Asia! Isn't that totally awesome?!? Oh the speedfreak in me is shaking with anticipation. BUT THEN, I'm pregnant. And well, I don't think they allow it. DAMN. Oh well. So that's what's been happening so far. I'm going to play Angry Birds now.